The Mystic Krewe is proud to present a special evening with a special musical/technology act. 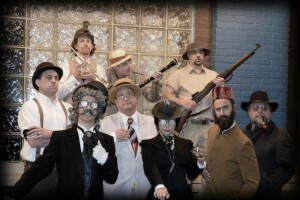 The New Orleans Steamcog Orchestra combines the sound of traditional New Orleans music from the 1910’s, with steampunk good looks and cutting edge technology. Led by ‘thousandaire’ philanthropist and n’er-do-well Prof. Pinkerton and his granddaughter Formelda Hyde-Pinkerton on vocals, the group sports a full horn section as well as xylophone, upright bass, and a variety of other intriguing instruments. A full exhibition of the technology behind the group’s mechanical clockwork drummer will follow the music, which will include lots of crowd pleasing foxtrots, waltzes, and if you’re lucky, some jump blues and latin dance rhythms. Bring your dancing shoes! The New Orleans Steamcog Orchestra is a Dixieland/Ragtime band with a difference! Male & female singers mix with trumpet, trombone, clarinet, xylophone, upright bass, piano & banjo. With the steady beat provided by ‘COGSWORTHY’ our amazing clockwork drummer, we provide an instant ‘turn of the century’ party for any occasion. The Steamcog Orchestra combines authentic and danceable brass sounds with a hip, humorous, appealing retro visual style that evoke old-world New Orleans. DATE: Friday, February 19, 2016, doors open at 6:30pm, show starts at 8pm. LIVE ONLINE: The event will be broadcast live online – link will be posted here and on the Facebook event page. Use the form below to order tickets. There is a limited number of tickets available. This is a very special show in a private venue – in addition to the performance we have a pot luck with food and snacks and an open bar (BYOB), and the PinChurch’s amazing collection of vintage pinball and arcade games (Largest in the South) available for everybody to enjoy before and after the show. Our venue is not normally open to the public, so this is a special opportunity to visit if you pre-order tickets. You will be contacted via e-mail with details and the address of the venue, which is conveniently located in the Metairie/New Orleans area. Use the form below to pre-order and secure your place! Tickets are $20 per person while they last!